Sean has never strayed far from his true passion of teaching. He believes educating his clients is the most important part of his job, and incorporates it in his business to benefit his clients. Sean moved to Chicago in 1992, spending 5 years as a teacher at an alternative high school and as a childcare worker in a residential facility serving at-risk youth in Chicago. The skill set that helped him excel in those challenging settings benefit his clients today. He is thankful that he is in a position to help others. Today, Sean uses his extensive educational background to help clients actually understand their entire financial plan and financial future. Simple, straight talk allows Sean to communicate complex content to clients in an easy-to-understand manner. The culture of his business is critical for Sean. He says, “I treat everyone as if they were my favorite uncle and they were solely relying on me to manage their life savings.” This can be a heavy responsibility, but his sound fundamental approach helps simplify the process. After analyzing a client’s current financial situation, Sean will educate them about their financial options educating them about risk and deliver a simple, customized and disciplined approach to help meet their objectives. Sean believes strongly in being an active member of his local community. He remained dedicated to improving inner city education by serving as the President of the Board of Directors of KIPP Ascend Charter School on Chicago’s west side. Liz and Sean moved their family back to Sean’s home state in 2009 to raise their family; Sean enjoys spending time with his wife, Liz, and their three children (Gracie, James, and Joseph). They belong to St. Catherine’s Church in Seaside Park, where Sean is the President of the Pastoral Council. He loves volunteering to coach soccer, baseball and basketball. He recently relocated his office to reduce his commute to two minutes allowing him to maximize the time he spends with Liz and the kids. Sean F. Monahan is proud to have been recognized as a Founder's Club advisor for 2018—a distinction based on annual production that places him among the top 37 percent of advisors affiliated with Commonwealth Financial Network. Carolyn has been serving Financial Alternatives clients since 2000. As Office Manager, she is a dedicated professional and believes strongly in extraordinary client service. Carolyn enjoys working with our clients and getting to know them. 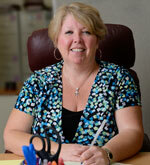 Carolyn has more than 30 years of experience in client service and administrative support. Carolyn takes great pride in a 2016 Client Survey which showed an overwhelming satisfaction rate with the firm in general, including her role as Administrator. Carolyn and her two sons have lived in the Toms River area since 1996. Carolyn is active with the Altar Rosary Society of St. Justin's Church inToms River. In her spare time, Carolyn enjoys spending time with family and friends, playing with her dog, traveling, music and reading. She has recently spent two weeks in China and looks forward to going back. During the warmer months, she also enjoys going to the beach, gardening and bike riding. William (Bill) Berg started his career in the financial services industry immediately after graduating from Rowan University in May, 2016 with a bachelor’s degree in Finance. After working for nearly two years at another firm, Bill decided to move his practice to Financial Alternatives in January of 2018. When working with clients, Bill adheres to a very thorough process to completely understand the client’s financial goals, dreams, and concerns. Once understanding these three key areas, Bill develops customized strategies for each client to reach these goals. After completion of this initial strategy, Bill and his clients work together over time to track progress or make changes as needed. Throughout the entire process, Bill believes the most important part is educating clients. He says, “I strongly believe that if you are not educating your clients, you are doing them a disservice.” Along those same lines, Bill believes in educating himself as well, holding FINRA Series 7, 63, and 65 securities registrations, as well as holding life, health, and long-term care licenses. Bill grew up locally in Brick Township, where he still lives today. In his down time, he enjoys playing recreational sports, such as softball and flag football, or exercising at the local CrossFit gym.